The type of a and x must be related, otherwise compile time error saying convertible type. In the normal logical operator (& or |) we have to calculate both arguments compulsory, some times it may creates performance problems ,to improve the performance short-circuit operators were introduce. Bitwise operators can be applicable for both Boolean, integral types,Short - circute operators can be applicable only for Boolean type . Bitwise operators Both operands must be evaluated,Short - circute operators evaluation of second argument is optional. Bitwise operators performance is low ,Short - circute operators performance is high. x && y ----> If x is true then y will evaluate. x || y ------> If x is false then y will evaluate. We can use equality operators for the comparision of primitive numbers , characters,boolean values. Return type is Boolean. We can apply these two operators = = and!= both for primitive types and object references. In the case of primitives these operators via check magnitudes or the values.Smaller data type promote bigger data type automatically. In the case of object references double equal operator always cheeks for address comparison.i.e s1= =s2 true iff and only if both s1 and s2 pointing to the same object. We can not use double equeal operator for different types of objects, violation leads compile time error saying incomparable types. s = = null; // the result always false. ”Java “<”Laxman” -----> Compile time error saying operator java.lang.String,java.lang.String. X-OR( ^):- If both are different then only the result is true. we can apply these operator only for Boolean and integral types . we can’t apply these operator for the floating point data types. Ex:- 4.5 ^5.5----- compile time error saying operator X-oR can’t be applied to double, double. i.e, ~true invalied ---> Compile time error saying operator ~ can’t be applied to Boolean.
! 3 -----> compile time error saying operator ! can’t be applied to int. & , | , ^ -------------> we can apply both integral and Boolean.
! -----------------> only for Boolean type. 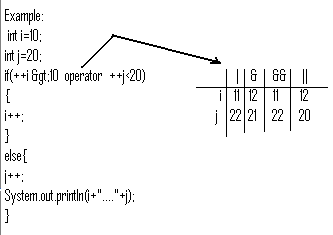 The only available ternary operator is the conditional operator. We can perform nesting of conditional operator also possible. This can be used for create of objects. new and instanceof are acts as both keywords and operators. [ ]-----> This can be used for declaration and construction of arrays. In the case of compound assignment operator compiler will take care about type casting problems . i.e it can perform internal automatic typecasting . Why because chained assignment is not allowed at the time of declaration.